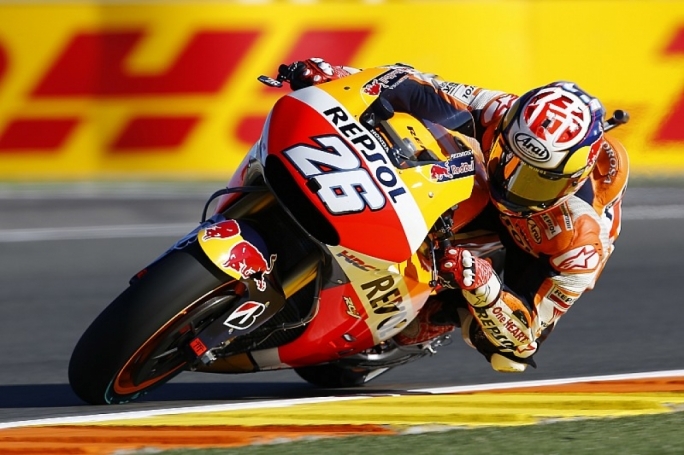 Dani Pedrosa (Repsol Honda Team) took a stunning pole position in the heat haze of the Catalan GP, storming clear of the field by three tenths to return to the top for the second time this year. Compatriot Jorge Lorenzo (Ducati Team) shot into second for his first front row start in red - after also proving second fastest on Friday - as two of the home heroes led the charge. Third was an incredible front row for Mugello podium finisher Danilo Petrucci (Octo Pramac Racing), as the Italian kept his momentum from a stunning home race last time out. The sun shone more on Aleix Espargaro (Aprilia Racing Team Gresini) in fifth as his impressive pace from the morning continued into Q2, with another home hero just behind him in seventh – Reale Avintia Racing’s Hector Barbera. Mugello winner Andrea Dovizioso (Ducati Team) heads up row three, ahead of Q1 graduates Jonas Folger (Monster Yamaha Tech 3) and Maverick Viñales (Movistar Yamaha MotoGP) in a tough day for the Yamaha machines. Alvaro Bautista (Pull&Bear Aspar Team) completed the top ten and was another multiple crasher on Saturday, with Scott Redding (Octo Pramac Racing) and Andrea Iannone (Team Suzuki Ecstar) in P11 and P12 respectively.